Seventeen-year-old Emma Lindsay has problems: a head full of metal, no parents, a crazy artist for a guardian whom a stroke has turned into a vegetable, and all those times when she blinks away, dropping into other lives so ghostly and surreal it's as if the story of her life bleeds into theirs. But one thing Emma has never doubted is that she's real. Then she writes "White Space," a story about these kids stranded in a spooky house during a blizzard. 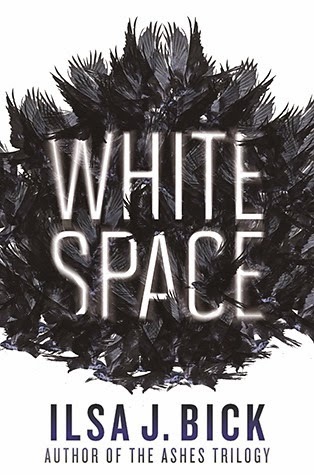 Unfortunately, "White Space" turns out to be a dead ringer for part of an unfinished novel by a long-dead writer. The manuscript, which she's never seen, is a loopy story in which characters fall out of different books and jump off the page. Thing is, when Emma blinks, she might be doing the same and, before long, she's dropped into the very story she thought she'd written. Trapped in a weird, snow-choked valley, Emma meets other kids with dark secrets and strange abilities: What they discover is that they--and Emma--may be nothing more than characters written into being from an alternative universe for a very specific purpose. Let me start out by saying that I loved Ilsa J. Bick's Ashes trilogy so much that I was so excited to see a new book by her. To say that White Space didn't live up to my expectations would be putting it mildly. I had an extremely hard time with this book, reached the halfway mark even with very great effort, and then it became a DNF for me. I just couldn't go through it any further. It's going to be hard to articulate what it was about this book that just didn't grab me, but I'll try. First off, you can't say that the book isn't suspenseful, because it was, but I was just so confused by the suspense that I couldn't enjoy it. The entire book confused the hell out of me, actually. I never knew what was going on, who they characters really were, or what the whole point of all this was. The story started out like it was right in the middle of the climax, and it took some re-reading for me to even get into it at all. In fact, I had to re-read several passages in the story to understand how we got from one thing or one place or one person to another. There was very little characterization done for anyone in the story... I felt like I was being led around by the nose by the characters, and that they were being led around by the nose by someone or something else. Imagine all the most disturbing images you've ever seen in every one of those eerie horror films you ever watched all spliced together into little mini-scenes with no context or direction, and you'll have a pretty good idea about what it was like to read this story. Did it raise the hair on my arms? Yes... and if there had been a good story and some context around it, that would have been a good thing. This, however, just seemed pointless. Naturally, the writer is very talented and writes beautifully, but I felt like I was swimming through molasses trying to read this book. I'm an incredibly fast reader, but it took me days to get to the halfway point and I felt exhausted once there. I know plenty of readers loved this book, but in the end, it just wasn't for me. If there was a point to it all, and an explanation for all the weird things going on, I guess I'll never know, because I just couldn't hang. I won't be continuing this series, unfortunately, but I look forward to future stories from this author, since I do enjoy her writing.